Congee is not only one of China’s most popular breakfast dishes but also a regular accompaniment to other side orders eaten throughout the day. The plain porridge meal is often considered as food therapy when you have an upset stomach and it is usually served with pork floss, pickled cucumbers, and salted duck eggs. Another regular condiment for porridge is furu, a kind of fermented tofu that is very salty with a wine flavor. It might be peculiar for foreign tastes, but is a typical dish on a Chinese breakfast table. There are sweet types of congee and salty types. The sweet types are usually cooked with dried jujube fruits, dried longan fruits, white fungus and walnut. Chinese people believe that this congee has benevolent effects on the human body. During Laba Festival (the eighth day of the 12th month on Chinese lunar calendar), temples in Hangzhou hand out free sweet congee to people as a way to celebrate the enlightenment of Buddha. Salty congee is usually prepared with meat. The most common one is congee with shredded pork and sliced century eggs. People in Guangdong Province, especial in the Chaoshan region, are known for eating a cassoulet congee with seafood. Shanghai Daily introduces three types of congee and where to find them in Hangzhou. Different from the Hokkien-style congee, the Cantonese congee is far less thick and the rice is wholly dissolved in water after hours of simmering. Having congee is usually related with the habit of “morning tea” in Cantonese-speaking areas. But it is obviously not just about tea. People would order up to 20 different types of dim sum in a casual family gathering for morning tea. Congee comes last as the staple part. The kind of congee unique to Guangdong is the “freshly boiled” congee (生滚粥). 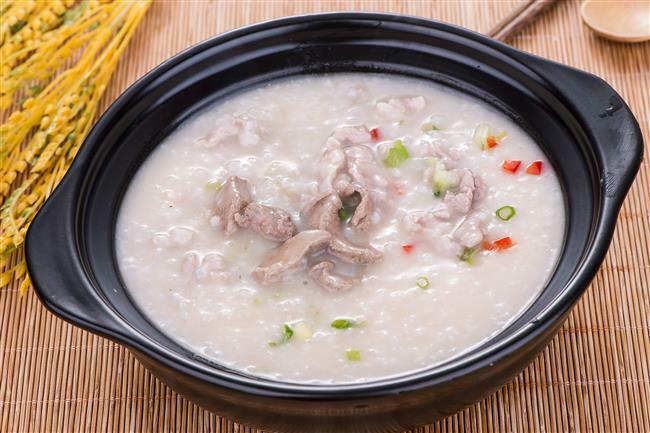 The white porridge is considered as a base for boiling ingredients like fish fillet, pork, beef and chicken. Congee with pork entrails and pork meatballs are called “To be a principal graduate” (状元及第粥). Legend has it that an impoverished scholar will achieve the highest score in an imperial examination after eating this congee. Locals, therefore, buy the congee for their kids when there is an important exam in the hope of ensuring them good results. Each restaurant has its own recipe for making the congee base. The meat is cooked in the boiling congee very similar to what you do in a hotpot. A fish fillet congee is made in two minutes. The secret is to control the timing, so the congee has a silky texture while the fish is really tender. Chaoshan refers to an area in eastern Guangdong, adjacent to Fujian Province. It consists of three cities: Chaozhou, Jieyang and Shantou. People from there speak a different dialect from Cantonese, which is closer to Hokkien, spoken by people in Taiwan and southern Fujian Province. They believe they have been relocated from Fujian Province in ancient times. Congee is a very important part in Chaoshan cuisine. They call it “mi” (糜), which is an archaic word but preserved in local dialect. Chaoshan people take congee at any time, even as a late night refreshment. They are never thrifty in making a congee. Typical ingredients could be crab, abalone, lobster and shrimp. A cassoulet of seafood congee usually cost around 100 yuan (US$15) serving three to four people. 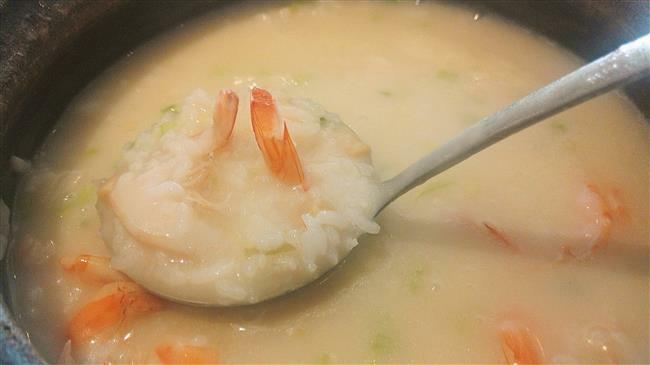 To prepare a shrimp congee, soak the rice first in cool water for one hour. Then stew the rice on a high heat in a cassoulet dish. You need to make sure you have to stir it regularly to ensure the rice is not stuck on the bottom or that it spills over. Seafood is added as the last step when congee is almost ready. Cut the fresh shrimps in half and put them in the cassoulet together with dried scallop, chopped celery and garlic as the only flavor enhancer. Experienced cooks turn off the heat early so that there will be a greasy layer of rice skin on top. Locals believe that is the essence of a congee and highly nutritious. Geylang is a well-known district in Singapore for nightlife and late night dining. Geylang Road divides the area from north to south, with lanes stretching perpendicularly from the main road. Tourists or visitors must try the local delicacies hidden in the southern lanes of Geylang and the frog congee is the best one. Bull frogs, each weighing around 250 grams, are used for the dish. They are stewed in crockery with a special oyster and soy sauce and it tastes especially succulent and smooth. The congee is served in separate crockery. And the right way to enjoy is by taking a spoonful of the sauce and blending it with the white porridge. 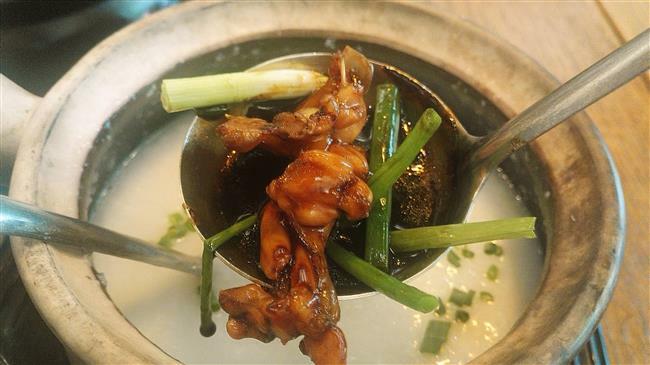 Two Hangzhou natives decided to bring back their favorite Singaporean bullfrog dish when they were studying there as students, and they opened the first Singaporean frog congee shop in Hangzhou. They collaborate with one of the most popular frog congee eateries in Singapore, Lion City Geylang Lane 9 Frog Congee. The secret sauce is imported directly from the owner. Frog with kung pao sauce is the most popular dish ordered by Hangzhou people. You can choose a degree of spiciness from little to super spicy. Address: 417 Zhongshan Rd N.